This batting practice zone cage collar is made with Vipol® Matrix Mesh to guard against cleat traffic during batting practice. 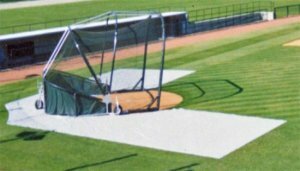 Batting Practice Zone Cage Collar is made with Vipol® Matrix Mesh to guard against cleat traffic during batting practice. It is non-absorbent and easy to clean by hosing. The unique fabric allows this mat to be left down for longer periods without damaging the turf. CHROMA-BOND Printing is available. Call for details or email us your graphics for a custom quote. $4,200.00 – $4,450.00 Call to order!